MAU is looking for self-starting individuals to fill open positions at one of the leading manufacturers in the Charleston, SC area! Start your new career with MAU at Mercedes-Benz Vans, LLC (MBV) in Ladson, SC. MBV is part of the division Mercedes-Benz Vans of Daimler AG, Germany, a global leader in assembling world class Sprinter Vans that were born to run. If you're interested in accelerating your career, stop by our Charleston branch located at 1470 Tobias Gadson Blvd, Suite 200, Charleston, SC 29407 on February 13, 2019, any time from 9:00 am to 4:00 pm. You can join the team at MBV offering starting pay of $15.60 / hour, paid holidays and vacations, opportunity for advancement, and so much more! Hiring event attendees are asked to bring a printed copy of their resume and . Click the job titles to learn more about each job opportunity. Start your new career with MAU at Mercedes-Benz Vans near Charleston, SC. Join the team that has been specializing in van creation and optimization for over 100 years. These jobs are entry-level positions with competitive pay and the opportunity for advancement. 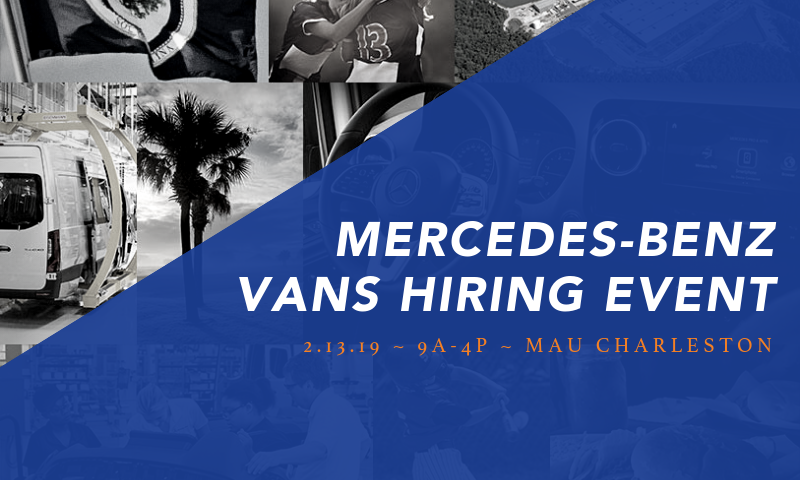 If you have a High School Diploma or GED, the drive to learn new skills, and the flexibility to work varying shifts, then click the map below for directions to the MAU at Mercedes-Benz Vans Instant-Interview Hiring Event! MAU Workforce Solutions is an innovative global company with extensive experience providing solutions for success in staffing, recruiting, technology and outsourcing to our clients, employees and applicants. Headquartered in Augusta, GA since 1973, MAU is a family and minority-owned company offering better processes and better people to create efficiencies and greater profits for our clients. Our relationships with world-class companies, our training programs and our culture of family allow MAU to offer better results, better jobs and better lives to those who work with us. Learn more about job opportunities with MAU in Charleston at .